Before you can start developing, you have to setup Eclipse. 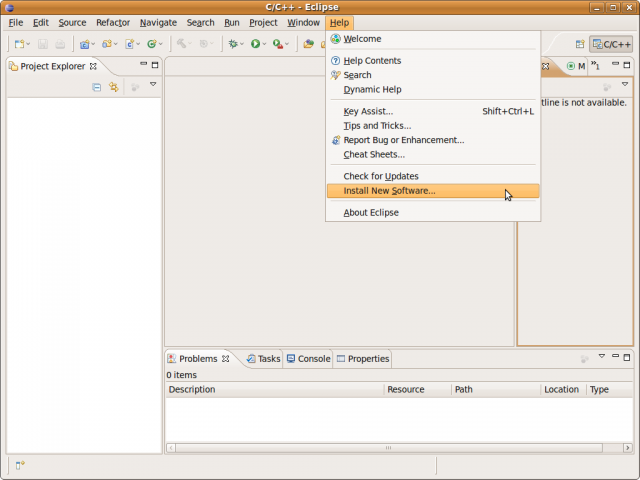 Your first need to install Eclipse Galileo with C/C++ support. The easiest way to do this is to download "Eclipse IDE for C/C++ Developers" from http://www.eclipse.org/downloads/. You can of course use an already installed copy of Eclipse. In the following dialog, chose "Galileo - ..." for "Work with:" as shown in the screenshot and select the needed plugins. Now Always choose "Next" and accept the license, when your asked to do so. In the last dialog click "Finish" an wait for the plugins to be installed. After that, restart Eclipse. If you also want to use the serial terminal from inside Eclipse, it is also needed to install the RXTX library. This can also be done via the Eclipse install dialog. The RXTX library is not part of the standard repositories so you have to add an additional site. After that select the "RXTX - End User Runtime" and proceed as with the other plugins. Now, all needed plugins are installed.